On February 27, Impark proudly announced its collaboration with The Forward Movement, a Canadian advocacy group campaigning for the support and adoption of the Dynamic Symbol of Access (DSA). 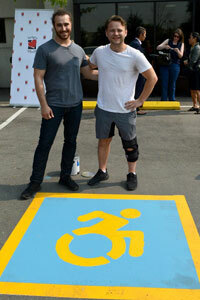 This collaboration encompasses Impark’s adoption of the DSA as standard for all new facility painting projects in Canada, along with a renewed commitment to providing barrier-free parking nationwide. The Forward Movement was co-founded by urban interventionist Jonathan Silver and social innovator Dylan Itzikowitz, who were stirred by calls for change taking place south of the U.S.–Canadian border. “We were inspired by an American organization called The Accessible Icon Project,” Dylan explains. “They’re design activists who designed the Dynamic Symbol of Access to raise money for a disability charity in Massachusetts. The Forward Movement officially launched in January 2017. Since then, it’s gained the support of over 70 disability charities, 12 cities and jurisdictions, and one gold-medal-winning Paralympian. After obtaining permission from The Accessible Icon Project to launch their own advocacy group in Canada, Jonathan and Dylan began building momentum approaching disability organizations for social media endorsements, which they quickly accumulated. So far, the movement has held seven painting and ramp building events at children’s hospitals, athletic facilities, and health clinics. The next painting project is scheduled for spring 2018 and will be Impark’s first application of the new symbol. But parking lots have also had another, serendipitous impact on the movement. With the support of the disability community behind them, Dylan and Jonathan began approaching companies they felt could make an impact. In the midst of arduous negotiations, it was a pleasant surprise when Impark in fact approached them. The details of our first painting event in collaboration with The Forward Movement will be released soon. Follow us on LinkedIn to receive updates on our progress.